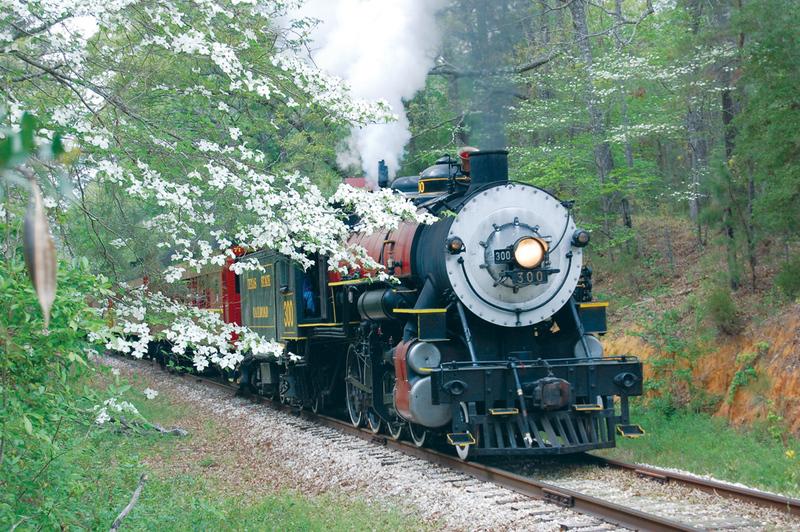 Piney Woods excursions on the Texas State Railroad (departing from Rusk) are among the activities planned for the 79th annual Dogwood Trails Celebration in Palestine. The celebration includes three weekends of events March 24-26, March 31-April 2 and April 7-9. Courtesy photo. PALESTINE – The beginning of spring brings signifies many things: warmer weather, flowers are starting to bloom and Easter is right around the corner. It also brings with it the Dogwood Trails Celebration in Palestine. In the spring of 1938, Charles W. Woolridge and Eugene Fish met for a cup of coffee. During their visit, both men agreed that Palestine needed its own dogwood trail. This conversation paved the way for the first Dogwood Trails Festival in 1939. Over the years, the festival has evolved from a small, roughly constructed trail to a major attraction, drawing thousands of tourists to the area. “We’ve been very fortunate to get people from all over the state and country to come out and see the dogwoods,” Palestine Chamber of Commerce executive director Marc Mitchell said. Dogwood Trails activities will start on Friday, March 24, including events such as the 11th Annual Boston Porter Memorial Bullriding event at the Anderson County Riding & Roping Arena. The 79th Annual Dogwood Trails Parade will kick off the Saturday, March 25 festivities at 10 a.m. The parade will start at the Anderson County Courthouse Square and end at the Farmer’s Market on Spring Street. This year’s festival, hosted by the Palestine Area Chamber of Commerce, will begin on Saturday, March 25 in downtown and Old Town Palestine. The gates open at 9 a.m. and the festival will continue until 4 p.m. Admissions to the festival is $1. Children 12 and under will be admitted for free. The festival sports a variety of vendors and activities for both adults and children to enjoy. Local and exotic food vendors also will be in attendance at the festival. Guests also will be able enjoy free live music and entertainment on one of two festival stages: the Sawdust Stage and the Family Stage. The Sawdust Stage, located in “The Hollow” in Old Town off Crawford Street, will host country artists Camille Rae, The Rankin Twins and Hunter Hutchinson from 2 p.m. to 7:30 p.m. The Family Stage, located at the intersection of Main and John streets will host faith-based singer/songwriter and Palestine native Heidi Mays and entertainer Professor QB the Clown from 11:30 a.m. to 3:30 p.m.
For more information about the artists or performance times, visit www.texasdogwoodtrails.com/music. While the festival on Saturday, March 25 is the main event, activities will continue the following two weekends, March 31-April 2 and April 7-9. For a complete list of Dogwood Trails Celebration festivities, visit www.texasdogwoodtrails.com.